Home renovations are popular projects to turn your house into the most comfortable space, providing you and your family with pleasant living experience. One renovation that is common is the building of a home patio. Easier than you may think, building a patio is the perfect way to create a living space that has the entire beautiful atmosphere as being outdoors, with the simple comforts of living indoors. There are a number of factors that go into building the perfect patio; each of which needs to be considered before building. Planning is always the first step in building just about anything and patios are no exception. The first factor you should consider during this planning stage is where exactly you plan to build the patio. Most people prefer it to be an extension of the home, but this is not necessarily how it has to be. In fact, if you put more time into considering the location of your patio, you will be able to make the most of it. For example, you shouldn’t put it too far away from the home because it will seem too “outside,” making walking towards it a bit tiring. Keep it close or attached to the home, but try to place it on the side of the house that has a good view. If your particular home does not have any appealing part, make one by placing water features, such as a small fountain. Shading is also an important factor if you are concerned about the patio getting too warm. If you build your patio going north to south, you will have the advantage of limiting the amount of sunlight that enters, thus keeping the structure from getting too hot. If you were to build it east to west, you are at the mercy of the sun’s direction at any given time of day. In addition to the location of the patio, how it is actually designed is important so that the patio blends in with the rest of the house; you don’t want it to look and feel very out of place. For example, if your house is more old-fashioned looking, build the patio to reflect this; if your house has a modern flair, feel free to make the patio more modern looking as well. Landscaping also plays a role in blending in because the plant life around the patio could enhance the outdoor feel of the space. Nearby trees can be utilised as well to increase the shading in the patio to cool it down and the lack thereof could help use sunlight to warm it up during the colder months. This factor depends on the climate from where you live, but either way, the landscaping should match well with the patio structure. When it comes to the actual building of the patio, the materials you use are important because they will determine the durability and lifespan of the patio. Hardwood is often used in patios and is a good option, but involves more maintenance. Metal, especially stronger steel, is also a great option because it is durable enough to withstand harsh weather, flexible and light enough to be easily moved and long-lasting enough to serve you for many years to come. Once you know where and what you want your patio to be, you can begin planning exactly how you want it to look and function. Thankfully, with our fully customisable designing process, you can do just this. Our patios come in a variety of colours and feature different options, such as gable or skillion roofs. When the time comes to begin building, our team of installers can help you wherever and whenever. Patios are the perfect addition to a home for merging the gap between indoors and out and providing an excellent space to entertain and enjoy the features of both settings. Planning is important to make the most out of your patio, so be sure to consider where on your property you want it and that it blends in with the rest of the home. 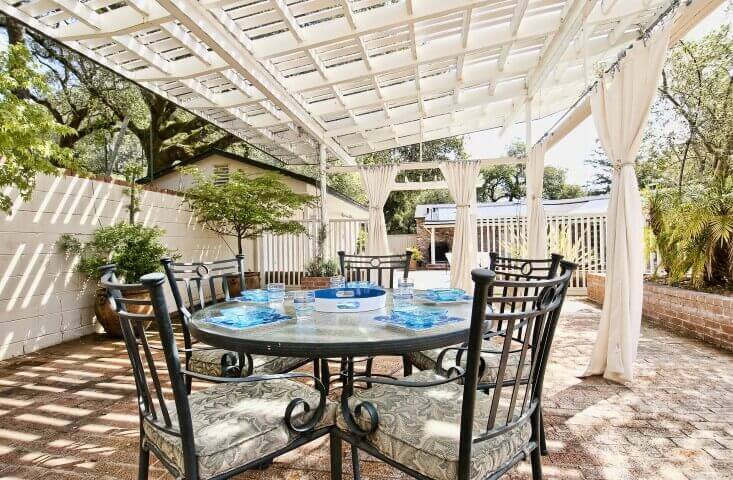 With the right materials in hand and all of your custom options settled, you can build the perfect patio for you and enjoy it with your family and friends for many years to come. To learn more about our options and for building advice, please call 1300 778 628.